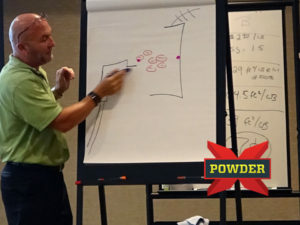 Powder X was founded in 2000 by Joey Golliver. Since then it has grown to quickly be recognized as the leader in powder coating equipment and training. We fully equip our clients through comprehensive training, support, and education on the best practices to get the most out of their industrial coating equipment. Powder X provides the highest quality powder coating equipment in the industry. Powder X was named to the Inc. 5000, a list of the fastest growing private companies in the United States published by Inc. Magazine, in both 2008 and 2009. Powder X serves clients worldwide. At Powder X, our top priorities are to assist our customers in the selection and integration of powder coating system components and to provide appropriate training and follow-up to ensure success of the enterprise. Joey Golliver has proven himself to be the expert in all facets of the powder coating industry, from industrial coating equipment manufacturing to integration, consulting and training. Golliver has trained thousands of entrepreneurs around the world in the profitable operations of a powder coating business. He was recognized in 2012 by Business Leader Magazine as one of the Top 50 Entrepreneurs in the country and was selected by the National Aeronautics and Space Administration (NASA) to be the powder coating consultant for the space shuttle project. Golliver’s companies have been recognized by Inc. Magazine in 2008, 2009 and again in 2014 as one of the fastest growing private companies in the United States. Golliver has made multiple appearances on national television, most notably episodes of Trucks!, HorsePower TV, MuscleCar, and Xtreme 4×4 all airing as part of Spike TV‘s PowerBlock Network.